Thinking of hanging baskets, it only conjures up images of lush planted colour, suspended from filigree brackets, faded red terracotta tiles as mountains form the backdrop. Yes, Europe! We have all seen these pictures and some of us have been privileged to visit these countries. Rows upon rows of hanging baskets greet us, pelargoniums and petunias trailing over the verges of the pots. With our living spaces becoming smaller and our gardens decreasing in size, we constantly look for clever ways to incorporate plants into our lives. Hanging baskets have the ability to make a dead space come to life, adding an extra dimension to our gardens and even indoors. Some of us have failed miserably trying to replicate these beautiful creations and have thought that we are dreadful gardeners. Gardening is a very practical thing, that’s why I love it. We just have to be clever in what we plant and have realistic expectations. Its all in the planning. The biggest mistake we make is wanting a hanging basket, planting it up and then hanging it in the wrong spot because we did not think it through. Plants don’t change, some love shade, other full sun. The rules still apply. You cannot expect a sun loving plant to grow in the shade and vice versa. Rule number one, find the area you want to hang your basket. Look around and take note of the suns position. Is it in full sun or dappled shade? Is there a wall that will catch the hot afternoon rays? 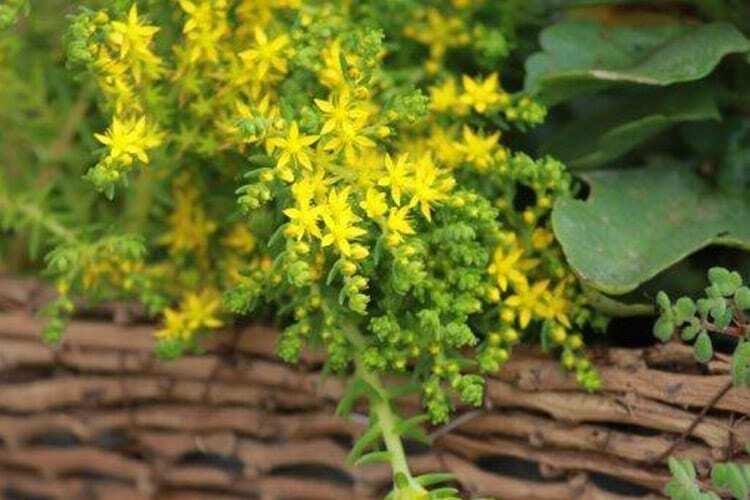 These factors will all dictate the type of plants you use in your basket. Rule number two, soil, soil, soil! It is the living stomach of the plant. Good soil is like a food warehouse, where the roots get their nutrients and grow. If you have poor soil, you will have poor plants. 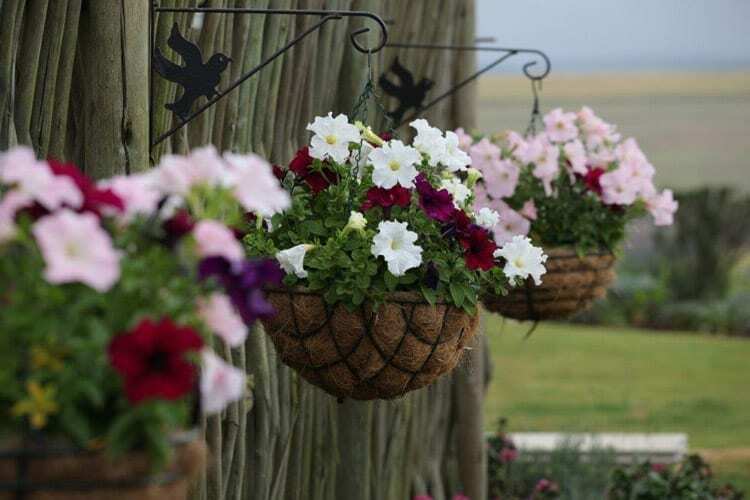 With a magnitude of styles available, you can find the perfect hanging basket for your décor style. Locate the area where your basket will be hanging. Choose your basket, make sure that it is sturdy and the chains or rope are able to handle the weight of the plants. Most hanging baskets, if not woven, have drainage holes. If not, drill some holes, you don’t want your flowers to have wet feet. 1. 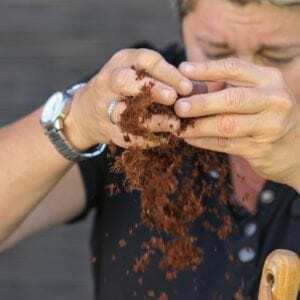 Mix a third deconstructed palm peat with your potting soil. Add a hand full of organic fertiliser and a sprinkling of bone meal. 2. 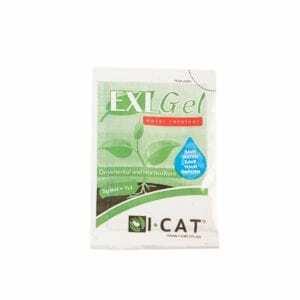 If you are planting up seedlings that need more moisture, add 5g EXLGel powder to your mixture, this will retain water for longer. 3. 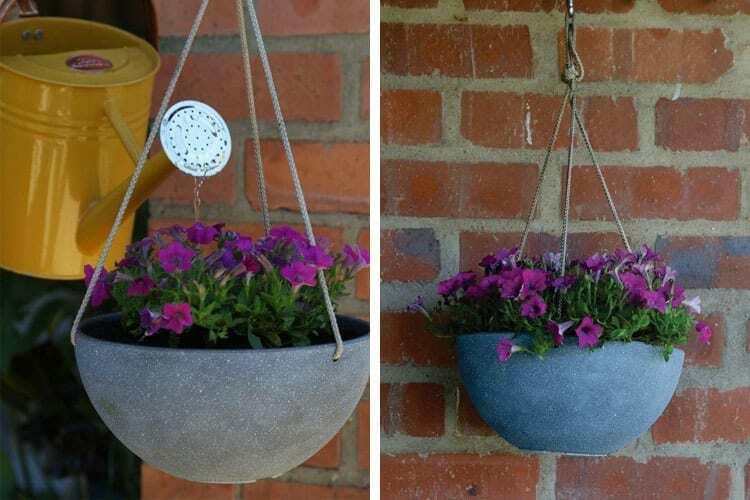 Place your hanging basket on a plastic pot, nestling it on the opening. 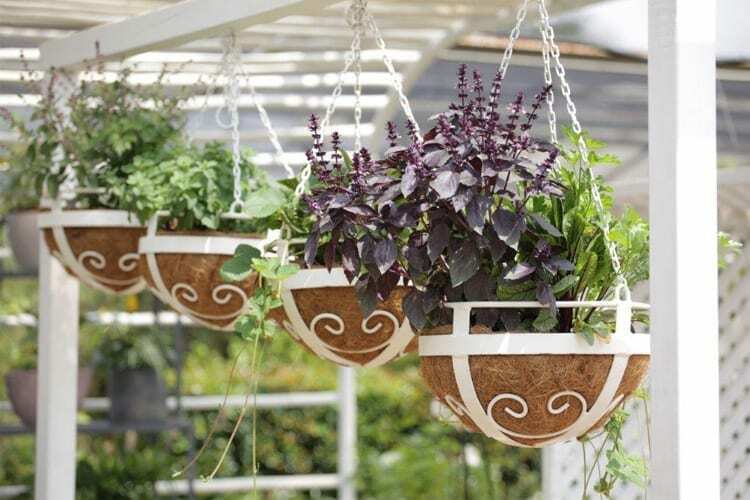 This way you can plant up your hanging basket with ease as it will not fall to the side. 4. Fill the bottom of your basket with the potting medium you have mixed. 5. 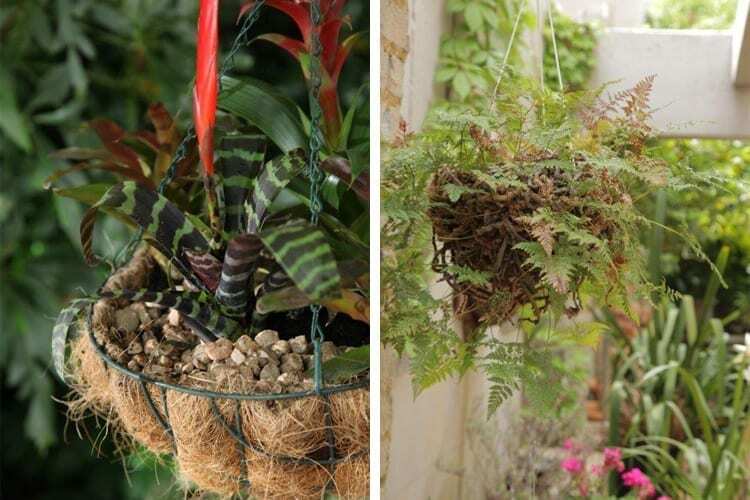 Place the bigger plants in the centre of the basket and if you have trailing or smaller plants, place them on the sides. If the roots are a bit pot bound, gently tease them loose before placing them in the hanging basket. 6. Fill the rest of the basket with your soil mixture and gently firm down. 7. Give a good watering and add a liquid fertiliser once a month to your watering. Water your hanging basket regularly when dry. 8. The last and most important. When hanging your basket, don’t hang it so high that you cannot enjoy what you have planted. Suspend between 1.2m to 1.6m, at your eye level. 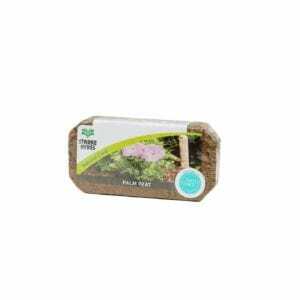 This also allows for easy watering and maintenance. 9. If you have planted annuals, deadhead regularly to encourage blooms. Also prune if one plant is outgrowing another, as to keep balance in your hanging basket. It is important to substitute your palm peat with silica sand. Succulents prefer drier soil. Do not add the EXLGel. 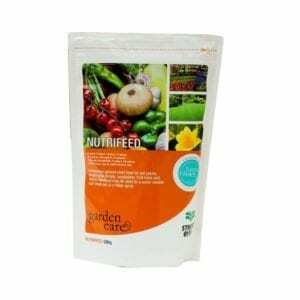 Do feed with liquid fertiliser once a month. These all come in an array of colours. Many Philodendron types have a trailing manner and this combination is perfect for Bathrooms and patios. And don’t forget the many Bromeliad hybrids available.